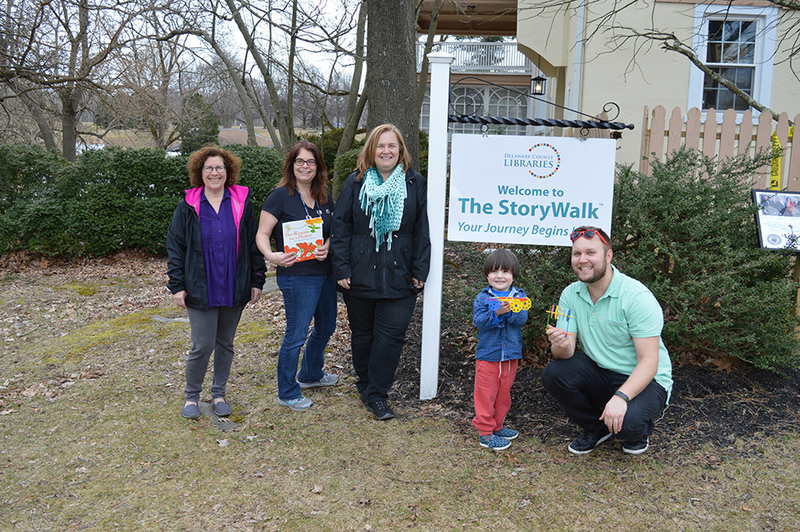 Members of the Delaware County Library System joined members of local libraries and students from across Delaware County to launch the newest StoryWalk book in Rose Tree Park on March 15. Delaware County Libraries partnered with Longwood Gardens on their Community Read Program, a program designed to encourage a love for reading and promote literacy. Residents are invited to stroll Rose Tree Park and read the new spring StoryWalk book posted in the park and then scan a code to receive free admission to Longwood Gardens. Delaware County Libraries staff and staff from the Middletown Free Library, Media-Upper Providence Free Library, and Newtown Public Library led local families along the StoryWalk path to kick off this year’s Community Read StoryWalk, featuring The Reason for a Flower by Ruth Heller. In this colorful and rhythmic book, Heller introduces young readers to the world of flowers, pollen, and seeds. After reading the story, families can scan a QR code with their smartphone, fill out a quick survey, and get ticket vouchers for free admission to Longwood Gardens. The Community Read StoryWalk at Rose Tree Park will run from March 15-April 26. StoryWalk is made up of 18 plexi-glass panel displays posted on a .25-mile circle located behind the Parks and Recreation office at Rose Tree Park and up the hill from the amphitheater. The outdoor reading experience is free and open during park hours and geared for children ages 1 to 7. StoryWalk is the creation of Anne Ferguson of Montpelier, VT. Delaware County’s StoryWalk panels were installed at Rose Tree Park with assistance from students at Williamson College of the Trades. Delaware County Libraries is an agency of county government that provides support services for 26 independent member libraries. For information about the wide range of library services available to all county residents, visit: www.delcolibraries.org.